The “Heart Cat” decorative dish design is based on a favorite Valentine card, “You Are My Heart Cat”, which in turn is based on a photo I took in 2009 of one of their heart-shaped hugs. It’s another of the things I’m making for the one of the things I’m working on for the upcoming cat show as well as for general sale, and it will be a special Valentine gift. 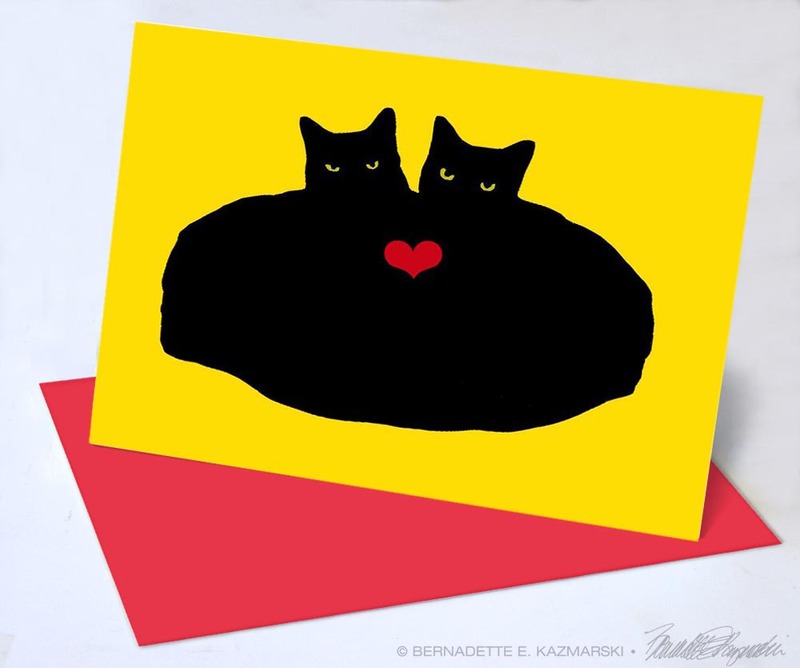 The siblings of the Fantastic Four often cuddle and hug, cheek to cheek, but this design, adapted from the original heart-shaped cats photo of Mr. Sunshine and Mewsette, is still my favorite. The background color is adapted from the color of their eyes, though the card printed a little too yellow and I just went with that rather than reprinting. This time I purchased a shade of polymer clay that was just about exact, except of three little packages of it, only one was the right color. I guess they just have eyes too pretty to match! You Are My Heart Cat Valentine. Like the Big Nap series of decorative dishes this one is also made of polymer clay rolled very thin, baked in a form and then painted. I’ve always like this shape for a dish, rectangular, but raised at the corners so it’s graceful but can still really hold contents. Edge of Heart Cat decorative dish. Because the clay is baked and it works best if the object is held to the final shape while baking the size ended up being determined by the one dish I could use to form the gentle curve I wanted that could also be baked in the oven along with the clay. I only made two of these dishes and of course they are going with me to the cat show. The color was difficult to match, and as I found even the color I thought was close was not, so after this I’ll make them from white clay and paint them, I have a little more control that way. I’ll make a few after the show and then list them on this site. Either way, this dish will be $15.00, including shipping. I like this shape of dish enough that I’ll be using it again too, as both a rectangle and a square. 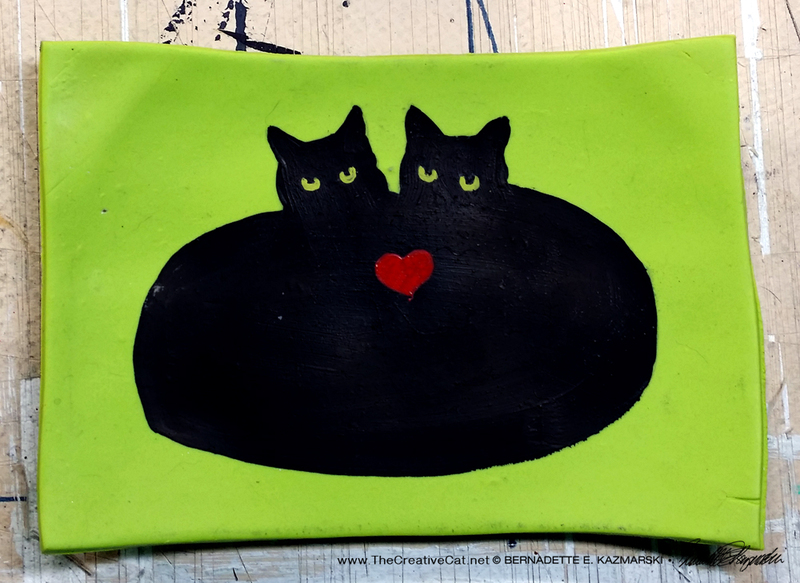 This entry was posted in black cats, cat artwork, feline artwork, Handmade Feline Gift Items and tagged cat art, cat artwork, cat gift items, cat merchandise, cat sketches, cats, heart cat, valentine on February 6, 2018 by Bernadette.